It’s easy to talk about being patient, but it is very hard to practice it. We know very well that nothing in the world can be mastered without patience. Nothing can be done easily to achieve anything good. We go through many hardships and pain and difficulties and also we experienced a lot of failures. Only after many failures, we achieved a little bit of what we really want to achieve, but just a fraction of it. But even to achieve that, it takes so much patience, much failures, and hardships. So, this is a painful process to master. And that’s why we need a patience. There is used to be a very interesting visa commercial. I don’t see that anymore. A father is watching a son playing with this board and then the boy writes something and then he shakes it and then the letter is gone and he writes again. I don’t know what it’s called, that little tablet. You write something and then shake it and gone and writes again. And the father goes to his refrigerator and then he sees his bill statement and he takes it and he shakes it and everything becomes a zero and the commercial said, “if life is like that, you don’t need a visa, but for everything else you need a visa.” I mean, how nice, if our life is that easy as portrayed in the commercial but when I really think about it, I might get boring. If life is like that, if I can get anything I want immediately then I’ll get bored. Life is challenging because there are things in life we can never master. If there were a pen that produces a sermon just like that, whenever I use it, sermon just comes out. Doesn’t matter how much thousand, $10,000. I’ll buy it. Life would be so much easier that way. But, come to think of it, if I have that pen, my life may be quite boring. The challenge we need these challenges, these challenges give us something to work for and something to pursue. That’s what makes our life exciting. There’s something that you cannot just master, something that you cannot just achieve. That’s why you’re working so hard, but still, you don’t get it, and that process itself gives us a little bit of meaning in life. Spiritual life is more exciting because it is hard to master because it’s challenging. Spiritual life is very challenging and it’s hard to master. Maybe there’s is no such thing as mastering spiritual life. That’s why spiritual life is so exciting. Spirituality always takes us beyond our comfort zone. Spirituality takes us always beyond what we can do easily. So it is very important to be patient in cultivating a spiritual life. Like the farmer who patiently waits for the rain to fall after they planted the seeds. We have to learn to patiently wait for the spiritual change after we put so much effort into it. Israelites had to learn this patience, in the wilderness for 40 years. Maybe that’s why God left them there to teach them what patience is all about. For 40 years they have to wait. And early Christians, because of their persecution, they experienced tremendous persecution in the beginning and they had to wait. They always called Maranatha, “come Lord.” That’s what it means. And they waited and persevered through all that persecution. I mean, it’s not that it wasn’t their choice. Their environment kind of demanded that from them. Almost a forced them to be patient. Sometimes you cannot choose our situation, our environment, our life circumstances and just forces us or demand us just to be patient. And the early Christians because they experienced a tremendous persecution, probably they built a muscle, spiritual muscle, muscle of faith. Maybe that’s why we still have Christianity after 2000 years later, if the Christianity was established very easily in the beginning, probably we may not even have Christianity now, but right in the beginning, they went through so much persecution and hardship. They build a strong spirituality in the process. So there is a blessing in disguise. It is hard to take him when he comes, but once you go through it, you become stronger. So it is a blessing in disguise. We may prefer an easy and comfortable life but who doesn’t? But let me tell you, be careful. When your life is too easy and too comfortable, I’ll tell you to be careful because you may lose your purpose of living. You may lose life itself. You may wonder if this is all about life. Just eating well and living well is that it? Sometimes you may get totally disappointed and disillusioned about your life. Faith grows on suffering and struggle. The best food for faith is struggle and suffering. People want to grow fast and when they want to grow fast, hardships, struggle, and suffering seem like the only hindrance. That slows down your growth, but let me tell you, if you change fast, you change fast. But if you change something, you’re back to zero fast. Nothing changes fast. Real change takes time. Real growth happens one step at a time. I believe in the power of doing little things every day. I think that it has tremendous power. If you can do something every day I believe you will see the power of that little thing that you do every day. Ancient Roman poet, Ovid said dripping water hollows out the stone, not through force, both through persistence. Even water can make a hole in the rock when it comes down continuously. Chinese has a word for that too, so I memorized, but I forgot now, sorry. I said it in KSM service and they were like, “wow! How did you know?” Of course, Google. You can get anything from Google except sermon. You know, faith is very simple. I believe that faith is a good habit. That’s what faith is. Good habit. Faith doesn’t happen overnight. You can never have faith if you don’t have a habit. If you don’t have a spiritual habit, doesn’t matter how long you been to church, you can never have faith. Faith is a good habit, and many years of spiritual practices produce faith as a result. And having a habit is very powerful. You don’t become an alcoholic by one binge drinking, but if you repeat heavy drinking every day, every night, it becomes a habit. And the habit controls you. A good habit is also very powerful. You know, Stephen King who write mostly horror books. I don’t read these books much, but one book that he wrote is a just beautiful book, made into a movie, Shawshank Redemption. I’m sure some of you have watched that movie, beautiful movie if you didn’t watch it. Stephen King wrote that book and he said, he writes every day, not a single day. He misses. He writes every day, including his birthday and holidays. He has a quota every day, 2000 words until he writes 2000 words he doesn’t stop his pen. He writes every day. Mark Twain said the same thing. The good habit makes a good writer. 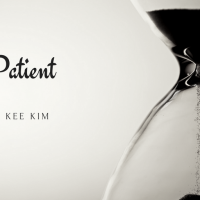 Being patient doesn’t mean that you don’t do anything and just wait. Being patient is you’re doing something believing that you’re doing something worth worthwhile and you believe that someday that will bring the result. So you patiently keep doing it. That’s what waiting is. Waiting is not just sitting down doing nothing. Waiting is you wait for the result because you believe that this is good and you wait for the result and continue to little thing over and over and over again, even though you don’t see the result right away. That’s what waiting is. If there’s one thing that you want to do in your life, put that in your daily schedule. Just don’t say that I want it. If you really want it, put that in your daily schedule. Anger is a problem. You really want to be free from the anger. Put that in the daily schedule. A complaint is a problem. Then put that in the daily schedule. For example, write a Thanksgiving journal every day. Okay. From today I’m going to write five items that I’m thankful for. Every day you write down why you’re thankful for. You keep doing that and your complaint will disappear. Someday, you’ll be a thankful person. Today’s the last Sunday of November already and next Sunday will enter into the last month of this year and then from January you’ll have a new resolution. But start now, from January to late. Think about what you want to achieve in 2018 and prepare yourself from now and start it. And then if you’re a success this year in 2018, the next year, 2019 add another habit. So every year add one habit at a time, what you want to do, what is really important to you. Do that and your life will change. I really enjoy TBS, Tuesday Bible study, and they are writing these days. What we do is different from other Bible Studies. One week I go and teach and then a week after they gather together with the computer, they sit down and they actually write about their life from what they studied. For example, Job first chapter about running away. And then next week they come together and they write about their life of running away. In the beginning, you know, they are like I don’t like to do it but now, after four weeks, my goodness, the depth of their writing. They’re going to be all writers. It’s a really deep and very interesting as they study. Habits are scary. You can build good habits, good spiritual habit, and your life much more enjoyable and joyful.